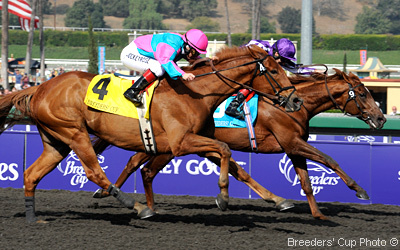 Bradley Thoroughbreds Racing Ventures are predicated on the total experience and excitement of Thoroughbred racing. In an inherently high risk game our mission is to find opportunities to race at the highest levels while keeping the costs as fair and reasonable as possible. Bradley Thoroughbreds puts together racing co-ownerships that have included such horses as Breeders Cup Winner and Champion Dayatthespa, G1 Winner Desert Blanc (FR), Multiple G3 Winner Watsdachances (IRE), Listed winners Goldy Espony (FR) and Premier Steps (IRE). Each owner has the opportunity to have the horse run in his or her name and silks based on percentage owned.